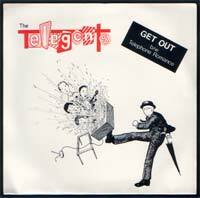 Other then that Get Out is another killer powerpop/punk ditty I know absolutly nothing about The Telegents. They released a second 7inch and then dissapeared. James/Worthless Trash? Steve/Low Down Kids? Need your help here guys. On Teenage Treats Vol. 10. Telephone Romance is just bad bad bad. Did I say bad? Ok. They were on the “From Bromley With Love” comp too: couple of tracks, haven’t heard them, though. I wasn’t blown away by the second single… could be the band weren’t either, cos they apparently didn’t make any effort to sell the copies they had made. Until a couple of years ago, obviously. Hi – I’m the brother of the bass player from The Telegents. If you’ve any questions I will be able to answer them for you! i am terry. used to be in a band with lead singer of telegents and kev. how are you kev? I remember them on the album Steve mentions and if my memory serves me correctly, they were one of the more professional sounding bands on it. Quite sure I saw them live once as well somewhere in a London venue supporting another band and if it was this band, was very impressed at the time. But all this was so very along ago now the memory is fading. Must have been about 25 years ago. the second single is great! Not so much I think. Got rid of it rather quickly.